There are more female PR professionals than female nurses. That is a pretty staggering number, especially when only 20 percent of upper management PR roles are held by women. 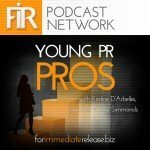 Young PR Pros hosts Kristine, Ross and producer Clare welcome Talia Beckett-Davis, president and chairwoman of Canadian Women in Public Relations, to chat about the gender gap that exists in our industry.